Gadkari's meeting comes two days after BJP President Amit Shah's meeting with Madhuri Dixit and Ratan Tata as a part of Sampark se Samarthan campaign. MUMBAI: Minister of Transport Nitin Gadkari, today, met Bollywood actor Salman Khan and his noted script-writer father Salim Khan, veteran actor Nana Patekar, and Yes Bank CEO Rana Kapoor at their residences here as part of the BJP's "Sampark se Samarthan" (contact for support) campaign. The former BJP president presented some booklets highlighting the achievements of the Modi government in the past four years to them. "Met Sri Salim Khan ji and Salman Khan as part of 'Sampark se Samarthan' campaign. Have discussed the achievement and initiative of Modi government in last 4 years," the Union Minister tweeted after the meeting. 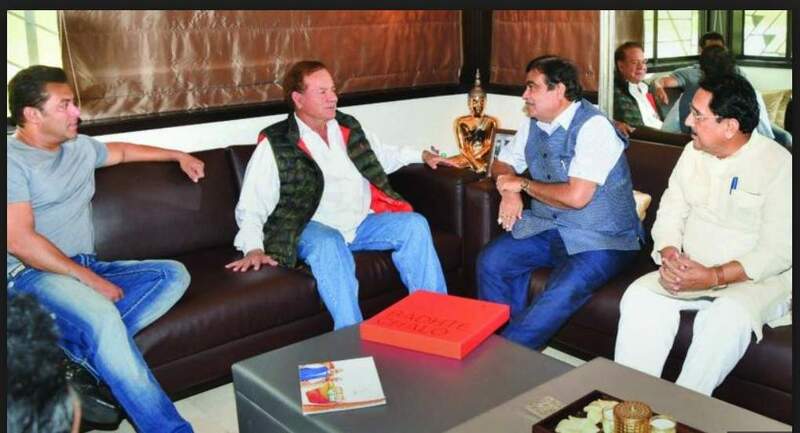 Though Salim Khan and Salman did not comment or tweet about the meeting, the two "liked" Gadkari's post on Twitter. Gadkari also tweeted after meeting Kapoor and Patekar, saying he discussed development initiatives of the Modi government in the last four years with them. The "Sampark se Samarthan" (contact for support) campaign was launched to mark the four years of the Modi government last month. As many as 4,000 functionaries of the party will contact one lakh people, who have recognised names in their respective fields, to inform them about the government's work in the last four years. Two days ago, BJP chief Amit Shah had called on actor Madhuri Dixit-Nene and industrialist Ratan Tata in Mumbai.